The following is a summary of the attached nine page paper entitled CMP Background and Current Status 2013 researched and written by Professor Clarence C. Elebash. The original Community Maritime Park (CMP) plan had merit. Many good people put much time and effort into it. However, the project is much changed from the original proposal. The baseball stadium is the only major component remaining as initially planned, and it was expanded from the original design. The stadium is impressive, and fans have a spectacular view. However, the ballpark dominates the entire 30 acres. It over-shadows and encroaches upon the public area and the amphitheater. In actuality, the CMP became a “baseball complex”. The success of the maritime park/baseball complex depends on commercial real estate development, but the real estate market has been in trouble since 2006. The basic CMP strategy was: 1) new development at the park would provide lease income to Community Maritime Park Associates (CMPA) for park operations and maintenance; and 2) increased property tax revenues (at the park and elsewhere downtown) would pay off the bonds sold to develop the park. Thus far, there is one commercial building under construction at the CMP and a second in the planning stage. No nearby development is directly attributable to the park. 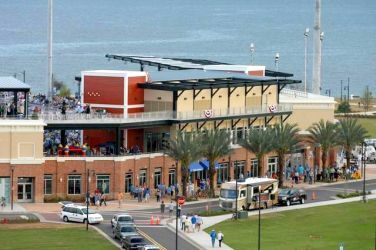 Blue Wahoos baseball is successful, but minor league stadiums do not create new economic activity. Fan support is strong, attendance is high and team owners are presumably making money. (Profitability is due in large part to a generous stadium lease.) The maritime/baseball park is costing the City millions of dollars in debt service, but minor league sports do not attract out-of-town money or out-of–town people. Money spent at the stadium mostly represents lost sales at other local food and entertainment businesses. 3) the City will be “at the mercy” of the baseball team owners when the stadium lease comes up for renewal. 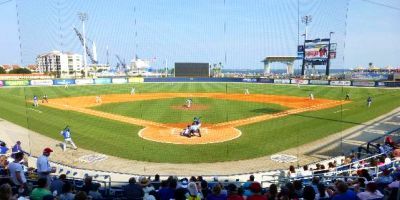 This entry was posted in City of Pensacola, CMPA Documents, Community Maritime Park, Pensacola Chamber of Commerce, Pensacola City Council, Uncategorized and tagged Blue Wahoos, Cincinnati Reds, Elebash, Florida, Maritime Museum, Pensacola News Journal, Quint Studer, University of West Florida. Bookmark the permalink.